Watch Good Night, and Good Luck. "They took on the Government with nothing but the truth." 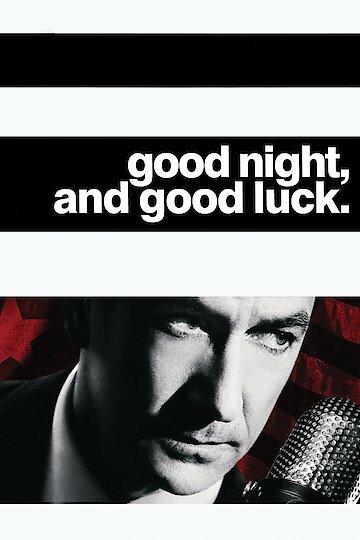 Good Night and Good Luck is an American drama from 2005 featuring the talents of George Clooney and David Strathairn. The film takes place during the early days of televised news, 1953 to be exact. Edward R. Murrow (played by Strathairn), co-producer Fred Friendly (played by Clooney), and a reporter named Joseph Wershba (played by Robert Downey Jr.) are sitting around in the newsroom of CBS television studios. It is here that the men decide to bunk pressure from both their corporate overlords as well as the channel's advertising partners in an effort to discredit Senator Joseph McCarthy for his witch hunt for Communists within the government and American society. The film also has a subplot involving staffers Joseph and Shirley Wershba. The two were recently married but must conceal this information to keep their jobs with CBS. The first act the men engage is is when Murrow defends a Milo Radulovich. Radulovich risks being expelled from the United States Air Force because of the political beliefs of his sister as well as his father being subscribed to a Serbian newspaper. Murrow goes as far as to make an entire show about McCarthy's attacks against him. A feud, easily viewable as this occurs on television, brews after McCarthy responds and declares Murrow to be a Communist. Specifically, that Murrow has membership within the leftist Industrial Workers of the World, a remark which Murrow states to be false. Despite the circumstances of the times, the newsmen continue on, ultimately striking a ringing blow against the inquisitorial McCarthy. Historical documents expose the questioning of Annie Lee Moss, a Pentagon staffer whose name appeared on a staff list for the American Communist Party. The signature moment of the film is a reenactment of Murrow's 1958 speech to the RTNDA. In this speech, Murrow repudiates his audience, begging them to properly make use of television as a means of alerting and educating the masses. More Like Good Night, and Good Luck. Good Night, and Good Luck. is currently available to watch and stream, buy on demand at Amazon, Vudu, Google Play, iTunes, YouTube VOD online.